South Sudan (Listeni/ˌsaʊθ suːˈdæn/ or /suːˈdɑːn/), officially the Republic of South Sudan, is a landlocked country in northeastern Africa that gained its independence from Sudan in 2011. Its current capital is Juba, which is also its largest city. It is planned that the capital city will be changed to the more centrally located Ramciel in the future. South Sudan is bordered by the Republic of the Sudan to the north, Ethiopia to the east, Kenya to the southeast, Uganda to the south, the Democratic Republic of the Congo to the southwest, and the Central African Republic to the west. It includes the vast swamp region of the Sudd, formed by the White Nile and known locally as the Bahr al Jabal. 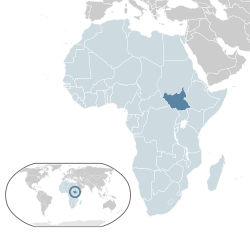 South Sudan became an independent state on 9 July 2011, following a referendum that passed with 98.83% of the vote. It is a United Nations member state, a member state of the African Union, and a member state of the Intergovernmental Authority on Development. In July 2012, South Sudan signed the Geneva Conventions. South Sudan has suffered internal conflict since its independence.